This Porcupette’s been busy asking lots of questions of some fine PQL authors recently, and Mark Lavorato, whose poetry collection Wayworn Wooden Floors is forthcoming from the Quill in Spring 2012, has a lot to talk about. With two books coming out in the next 12 months (his second novel, Believing Cedric, is forthcoming from the fine folks at Brindle & Glass), memories from a recent trip through the Alps, and his musical and photographic talents, we wanted to find out more about Mark. Wouldn’t you? Read on for a snippet of our interview! PQ: What would you say inspired you to write Wayworn Wooden Floors? ML: I’m drawn to the idea that poetry is simply the everyday, which, as a matter of perspective, has become, suddenly, song-worthy. I have a few lofty ideas in the collection, but the majority are fairly ordinary events that are being looked at and placed under the microscope in a lofty way. I would love to incite the reader into thinking of his or her own life as being filled with as much poetry as any other. It’s just the magnification and the Petri dish that make it verse. In all of my writing – my poetry, short fiction, novels – I draw inspiration from real events, real people, and real history. (In fact, the very theme of my second novel [Believing Cedric] is Canadian poetry.) So I guess you could say my inspiration has always been the same: the most real moments of real life. PQ: Much of this collection was written while on a 1000km trek. What does it look like writing while hiking every day and living out of a backpack? ML: It’s fantastic! There is an element of poetry that strikes me, more and more, as being entirely 21st-century friendly. We live in a time of condensed video bites and sound cues. And if you think about it, poems are really literature’s version of a YouTube video, iTunes sampler, or Facebook posting. They are ideas broken down into their most essential parts, a kind of tincture of reality. Well, the randomness of travelling in a foreign country, of having no constancy anywhere in your periphery, keeps you in that highly dynamic frame of mind. It is so easy to shift gears, become fascinated with something new, delve into it, ask questions, and move on, while you are doing it in your physical life, as well as in a tiny, virtual, word-processing world. Curiosity feeds on itself. I definitely plan on doing other long treks while writing poetry in the future. For me, Wayworn Wooden Floors is only the beginning. PQ: That’s interesting, that you’re comparing poetry to Youtube videos and Facebook postings. How do you think these new forms of communication are affecting literature? Have you noticed a change in how you read now? ML: I think, undoubtedly, our attention spans are shrinking. We’re becoming less patient. But I’m pretty sure what we are less patient with is indulgence. No one’s going to wait around while a writer slothfully plods along on some circuitous path to get to the meat. Or a director, or animator for that matter. Books are becoming shorter and shorter, more poem-like, if you will. I don’t necessarily think it’s a bad thing at all. Are we going to have classics written in the 2010’s, which will be read a hundred years from now? Absolutely. Will they be more engaging to read than classics from a hundred years ago? I happen to think so. PQ: You are also a musician and a photographer – is your creative process similar across mediums? Do some sketches lend themselves more to one medium than another? How do photography and music feature in your poetry? ML: I feel so lucky to have music and photography in my life, as well as writing. What’s great about having all of these different venues to create (literary, audio, and visual) is that they’re there for me most when I fail. When I try and express something that needs to be expressed, but the words fall drastically short, then maybe music will succeed in their place. And if music fails, then maybe an image will work instead. What’s more, they all take a different level of energy to do; they exhaust different muscles, so to speak. I can write in the morning, shoot in the afternoon, and jam in the evening. But couldn’t dream of doing only one, all day long. Maybe I’m more of a product of our ADHD-century than even I’m aware of. PQ: What does your writing routine look like? ML: To be honest, the more I hear about the writing routine of other poets, the more I realize how mine sounds kind of crazy. For starters, I cannot imagine doing what most writers do: sitting down to a blank page in the morning with the cursor blinking away, tapping it’s one finger, waiting for me to be inspired and put something down onto the white. Instead, I draw my inspiration at other, frankly inopportune, times, like while travelling, or at a fantastic concert, a meal with friends, out shooting (photographs) in the streets, doing research for my novels, climbing, etc., etc. And when I have one of these inspirational moments, I sprint to a piece of paper, keyboard, or digital tape recorder, and quickly spill it out in a messy, chaotic rant of words and ideas. I call these “sketches.” I then collect these for months at a time, even years, waiting until I have enough of them, as well as enough time to dedicate to them. What this means is that between writing novels, I’ll suddenly find myself with enough sketches to write an entire collection, and so will dedicate a block of time to doing so. Meaning, much like the outline of a novel, I know what my poetry collections will look like, down to the subject, and sometimes even style, of every last poem, before a single poem has even been written. It may be unorthodox – and I’m sure some would say too methodical for the artistic process – but it’s what works for me. And it certainly keeps me from writing flat poems. PQ: What do you mean by “flat poems”? ML: Well, Isaac Singer once wrote, “The wastebasket is a writer’s best friend,” and I definitely keep one close at hand. Mine is a file on my Mac called “Poems that aren’t that great,” and I sometimes open that file up to see if I can tease out a rule about what makes a poem a failure. And I find that it’s just that, they’re flat. The underlying idea and voice isn’t stark or powerful enough. What I guess I’m saying is, they’re not poems that need to be written, aren’t perspectives that have to be on paper, that are wrestling for a life of their own. They’re just pretty words that end up being pretty empty. What is fascinating to me is that, the more ornate and flowery and intricate a poem that I’m working on becomes, the more I can be sure it’s time to throw it away. To me, the more authentic and relevant the message is, the clearer the language must be to relay that message. Convoluted words and structures are, in my mind, the most telltale hiding place of someone who has little to say. I think if I wrote poems while chasing after an empty cursor in the mornings, all of them would be flat, and all of them would end up inside my friend, the wastebasket. PQ: The collection is dedicated to the memory of Alden Nowlan. What is it about Nowlan’s poetry that speaks to you? I think Alden Nowlan wrote so many sincere, evocative poems with incredible honesty and humility. Poems are usually way more important to me than poets, but, sometimes, the poet stands out as being able to deliver that which is gritty and difficult, in a graceful and elegant way. Which is certainly the case with him. Alden Nowlan struggled in all kinds of ways, knew serious hardship and difficulty, and still wrote beautifully about it. In a sense, the collection is really dedicated to the pure and powerful poem, which, undoubtedly, Alden Nowlan pulled off in spades. PQ: Was there any specific event on your trek that inspired a particular poem? Tell us about it! 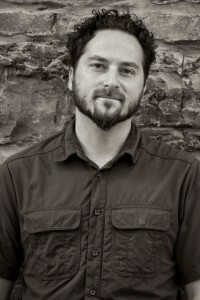 Look for Mark Lavorato’s debut poetry collection, Wayworn Wooden Floors, this spring from the Porcupine’s Quill! Readers, now it’s your turn – what would you like to know about Mark? This entry was posted in Letters from the Porcupette (the Intern's Blog) and tagged interview, mark lavorato, poetry, pql authors, Spring 2012, wayworn wooden floors. Bookmark the permalink.